Tenrod Australia have introduced the Dominant Primax NAW-BSG-NP-1 LED, which provides high intensity light output in a small package. The Primax package has a compact size of 3.5mm x 3.5mm with an ultra low height profile of 1.2mm. The Dominant Primax NAW-BSG-NP-1 LED is rated at a typical output of 21lm at 150mA with 120° viewing angle. The LED is compatible to IR reflow soldering and is environmentally friendly as well as RoHS compliant. The Dominant Primax NAW-BSG-NP-1 LED is ISO/TS16949 certified, meeting the quality requirements of the automotive industry. 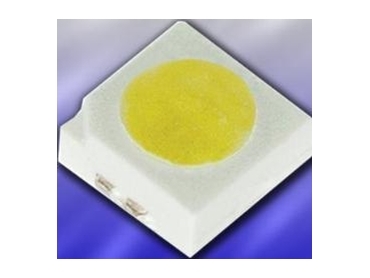 The Dominant Primax NAW-BSG-NP-1 LED allows designers to avoid the high thermal stresses and problems of higher current LEDs while still providing an economical source of illumination. The Dominant Primax NAW-BSG-NP-1 LED is suitable for backlighting, signage, exterior automotive lighting, architecture lighting, decorative lighting, garden lighting, general lightings and channel lightings.